I have been fascinated by cassoulets ever since I saw a Julia Child recipe in her Menu Cookbook. Julia's recipe is definitely not for the faint of heart. It requires 3 types of meat- pork, sausage, and goose (I'm not even sure I know where to buy goose from). The recipe also states that it requires more than 4 hours of cooking time (plus more for preparation). That's the required time for normal people, so for someone like me, this recipe would take oh, roughly...4 days. Yup, that sounds about right. One of these days (I'm thinking maybe sometime around retirement?) I'll try Julia's recipe, but until then I will definitely be making this simpler vegetarian version often. It takes about 2 1/2 hours from start to finish - including preparation (and yes, even for me!) and is so delicious and hearty that even my carnivorous BF didn't miss the meat. Although I'm sure a few chunks of chicken or sausage wouldn't hurt a thing, and would certainly bring you one tiny step closer to Julia's version. 1. Cook leeks, onion, carrots, celery, and garlic in oil with herb sprigs, bay leaves, cloves, and 1/2 teaspoon each of salt and pepper in a large heavy pot over medium heat, stirring occasionally, until softened and golden, about 15 minutes. 2. Stir in beans, tomatoes, tomato paste, then stock, and simmer, partially covered, stirring occasionally, until carrots are tender but not falling apart, about 30 minutes. Hey Ms. Meanie, this cassoulet sounds wonderful. Oh, and I still see plenty of pretty leeks around here-probably all from California though, which is not local for us. deve essere buonissima! complimenti! ciao! Love the colors of veggies in the bowl...vibrant! Have I mentioned how jealous of you I am about this whole California business? Leeks are still kind of in season here since NY is quite a bit behind you guys! Which means I am lucky enough to still be able to make this fabulous dish! Yes, I have California Envy - it's true! I am totally making this in the next week, since my Husband is on the healthy foods kick that he gets on every so often (which is happy, happy news for me, since I can get him to eat all sorts of things!!! ), and I think if I add a lone chopped up sausage (I am in Wisconsin, after all...) we will all be very satisfied with this! Wow! This looks AWESOME! Usually casseroles come out look ugly, but yours look amazing. My oh my am I going to love making this. I've never made a cassoulet without meat, but this looks divine. It may be summer here, but I would love a bowl of that tonight! The cassoulet looks wonderfully deep. The leeks appeal to the Welsh girl in me. Wow - this looks amazing! I might be stealing this - lol. 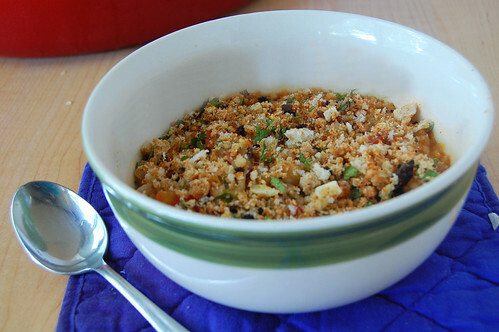 Your cassoulet looks amazing, especially with those crisp crumbs on top! I find the original version quite heavy, and fatty, so this one is more appealing to me. Maybe in a couple of months leeks will actually be in season here! 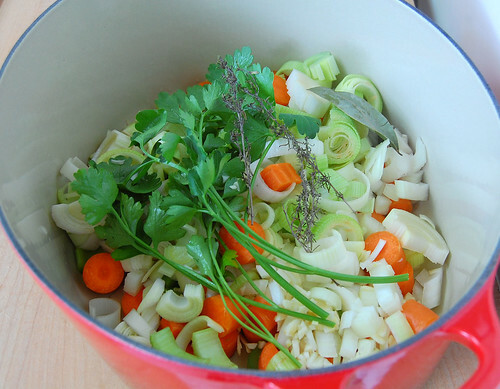 I have everything to make this soup except leeks and thyme. This soup looks so yummy! I've never heard of Turkish bay leaf. Will be keeping an eye for this one! Interesting...I've never heard of 'cassoulet' before. Do u eat it as is or with bread? I love the 2nd and 3rd photos - very nice colours! 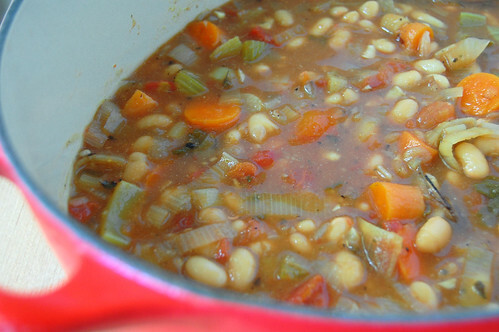 This looks absolutely delicious and because of you I was inspired to look up Cassoulet. 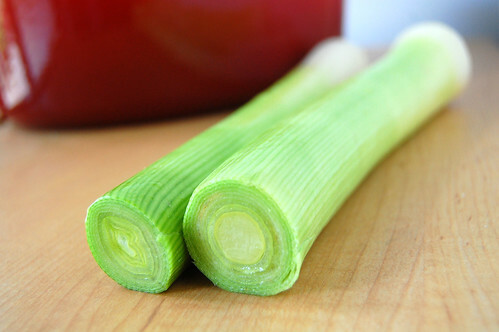 The other day, I was in the produce market near me and wondered, "what could I use leeks for?" This is my answer.